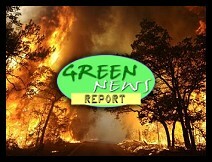 " 'Green News Report' - September 6, 2011	"
A tinderbox landscape and unusually windy conditions have caused more than 60 wildfires to explode across Central and East Texas - creating a hellish Labor Day for thousands of Texans. Two people have been killed so far. Driven by a relentless north wind, the blaze has jumped a broad, four-lane highway and the Colorado River - twice -as it keeps getting bigger. [T]he cost of the Texas drought, which climate change pushed to extremes, may be greater economic disaster. Earlier this month, Texas Agrilife Extension Service estimated losses to be at $5.2 billion - already greater than the $4.1 billion of losses from the 2006 drought. "This drought is just strangling our agricultural economy," professor Travis Miller, of Texas A&M University's Department of Soil and Crop Sciences. Losses, told TIME Magazine. While insurers have typically covered about half of the total losses in past storms, they might end up covering less than 40 percent of the costs associated with Hurricane Irene, according to an analysis by the Kinetic Analysis Corporation. That is partly because so much damage was caused by flooding, and it is unclear how many damaged homes have flood insurance, and partly because deductibles have risen steeply in coastal areas in recent years, requiring some homeowners to cover $4,000 worth of damages or more before insurers pick up the loss. The United States, the breadbasket and supplier of last resort for a hungry world, has been such an amazing food producer in the last half-century that most Americans take for granted annual bounteous harvests of grain, meat, dairy, fruits, vegetables and other crops. ... But climate change fears are sounding some warning bells. This is as uncontroversial as saying the sky is blue, in the sense that the atmosphere’s behavior is implicitly shaped differently than it was before the industrial revolution raised the concentration of carbon dioxide by more than a third. But the important question for society is how much climate events that matter to people are being meaningfully shaped by that rise in greenhouse gases. In the case of American hurricane risk, the science says there’s a negative trend in storm number, while storm energy and rainfall probably are rising. The demographic was more than twice as likely than other adults to say the media exaggerated seriousness of climate change. So one of the Department of Energy's big clean-energy bets --- Solyndra --- didn't make it. But this city is wrangling over which wrong conclusion to draw. The Tea Party Republicans, of course, see this as proof that America can't expect to compete --- and that clean-tech advocates and environmentalists were silly for thinking we could. The Republican National Committee turned Solyndra's bankruptcy into an example of the one modern innovation for which America's preeminence is unchallenged --- the campaign attack ad. Mainstream media, like the New York Times, pointed out that Solyndra failed not because it wasn't able to make electricity --- this was no "cold fusion" chimera --- but because cheap Chinese solar panels that use more conventional technologies beat its price point. How did the Chinese get so cheap? Not through innovation --- they lag behind the U.S. in solar tech. Not through labor costs, which are insignificant in making solar panels. No, the Chinese got cheaper loans, faster permits and more support from their government for their exports. When you think about Green Energy and its jobs, Albany, N.Y., probably wouldn't be the first city that pops into your head. But according to a report, the upstate New York region has the highest concentration of green jobs in the country. Another surprising area in the top 10: Cleveland and northeast Ohio. 500 MILES FROM THE NORTH POLE --- The minimum summertime volume of Arctic sea ice fell to a record low last year, researchers said in a study to be published shortly, suggesting that thinning of the ice had outweighed a recovery in area. Any serious oil spill in the ice of the Arctic, the "new frontier" for oil exploration, is likely to be an uncontrollable environmental disaster despoiling vast areas of the world's most untouched ecosystem, one of the world's leading polar scientists has told The Independent. Oil from an undersea leak will not only be very hard to deal with in Arctic conditions, it will interact with the surface sea ice and become absorbed in it, and will be transported by it for as much as 1,000 miles across the ocean, according to Peter Wadhams, Professor of ocean physics at the University of Cambridge. In fact, the only “risky” move is failing to aggressively pursue clean energy, failing to quickly reduce dependence on petroleum before peak oil forces us too, and failing to embrace a sustainable economy before the global Ponzi scheme collapses. Don Cheadle is obviously the best person to play Captain Planet in the movie version of the popular cartoon, hopefully they make his character a nicer guy. « PREVIOUS STORY "'Inside the Koch Brothers 2011 Summer Seminar': Part 1 of My 2-Part Exclusive at MOTHER JONES"
"'Green News Report' - September 6, 2011"
The wildfires in Texas are devastating but heat and fire (climate change) have been a big problem for the Lone Star State for several months. Perry does denies climate change along with other flaws but was off playing Presidential candidate when he should have been home taking care of state business.